I received my Creality 3D Ender 3 a while back. It is one of the few that I purchased and did not have sent to me to review. I’ll give this away, this printer is pretty amazing. For around $200, I can’t see ever picking up any other low-cost 3D kit printer, ever again. I honestly believe that this printer will own that price point until something else comes along that is at least as good. Follow this link if you want to see how easy this is to build and my initial thoughts. 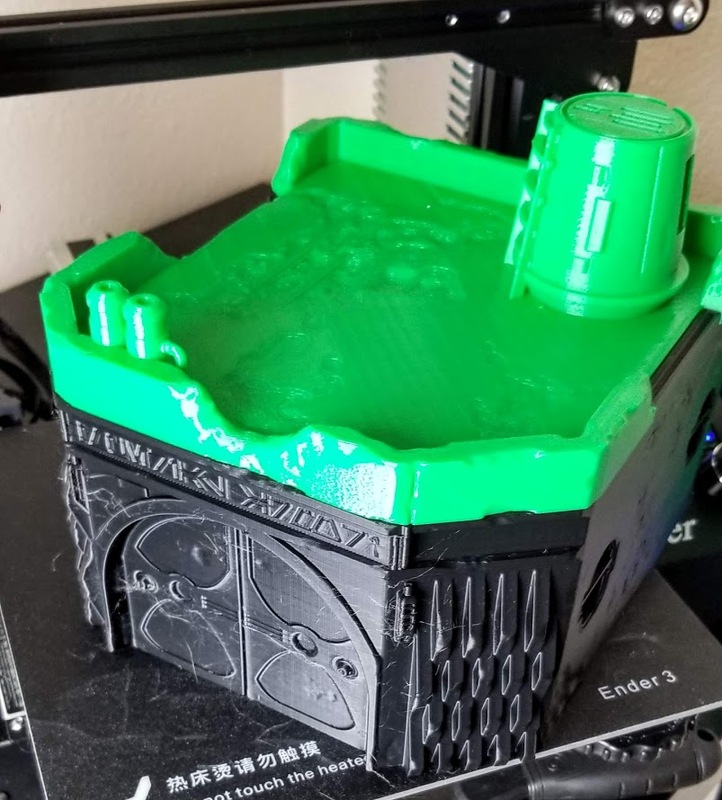 While the Ender 3 has had some initial issues (the first beta shipments had a few issues that were quickly rectified in later shipments), it has mostly come out for most people, to be a pretty terrific 3D Printer. There are a few issues, though, I have only seen one. A lot of people have problems with the PTFE tube coupler. It gives out, and quite honestly, I had the same problem with the Creality 3D CR-10s. This is not to say I have not had any problems. The bed was terribly warped. I could print on the outer about 2 or 3 inches, the middle was warped so bad. That being said, the fix was buy a $9.99 flat of mirror tiles at Lowes, and then asking someone to cut it to size. It’s worked terrific with cheap Aqua Net Extra Super Hold sprayed on the bed. 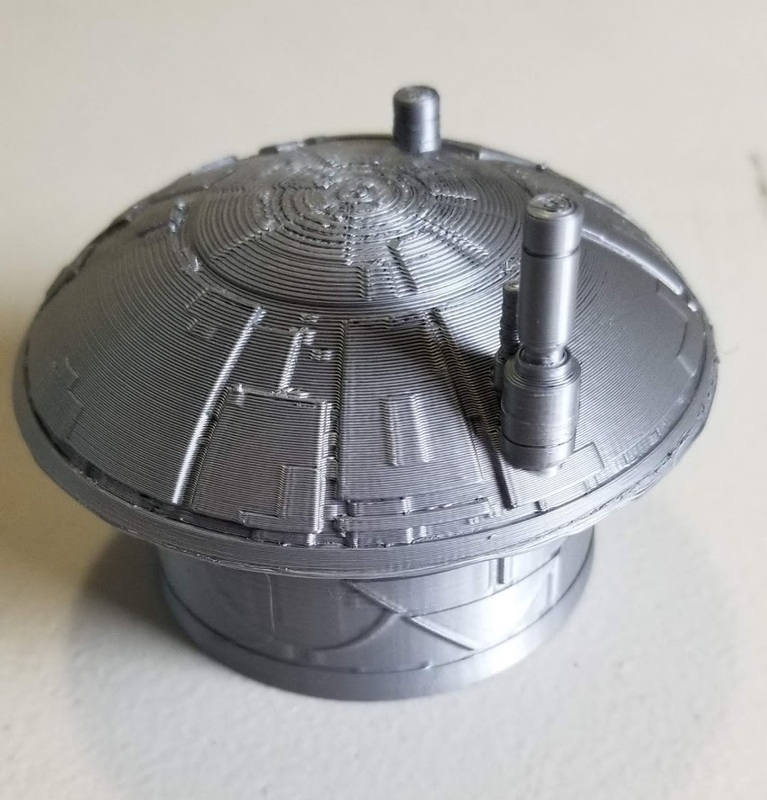 I’ve printed a large amounts of terrain using the printer, and even some miniatures. 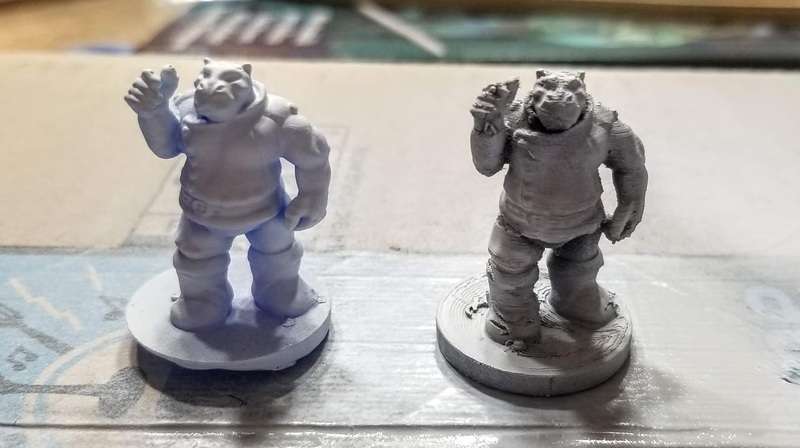 I am using an Anycubic Photon for miniatures, so I have not sent many miniatures to the Ender 3. Bed Size: 220 mm x 220 mm x 250 mm. This has a slightly over-sized bed that is terrific for terrain to print on. Bed Heating: fast heating bed, unlike the CR-10s. Power Consumption: My WeMo Insight tells me it averages 106 W and fluctuates between 58 W to 256 W. (My app shows it consuming $0.06 in power in the past 8 hours of printing from today). Many people worry about power consumption, but even used constantly, most 3D Printers should cost under $20, depending on power rates. In my area, I have it figured out to $8 a month, and that is a conservative number. I’ve actually been using Magicspace and Priline PLA filament in it since I received it. These are inexpensive filaments I really like. I’ve printed from small miniatures up to filling the bed with parts from Hayland Terrain, Worlds Over Run, Warlayer, Imperial Terrain, Necroplex, fidget spinners (Very young nephews) and several other things. This printer mostly just works. I do find leveling a glass bed to be a little more trouble than a PEI style bed, and except for one clog I had to clear today, I have not had any issues that I would attribute to the printer, rather than myself. Previously, I had one workhorse printer, but with the addition of the Ender 3, I now have two. I’ve come to depend on this 3D Printer for larger terrain than the stuff that fits in a 230mm diameter. One thing I love about this printer, is the oversized leveling knobs. They are huge, and about the same size as the ones I printed on other 3D Printers I own. It makes leveling so much easier. Since I run it on a Octoprint, the micro SD slot is a not an issue for me. (Some people don’t like it, and use converters on it. Thingiverse adapter for converter). I’ll admit, the printer just prints. Except for the one clog I mentioned above, it has been a major work horse for me. Others, like my buddy Daniel have run into a few other problems. I am including a link so you can see some of the things he ran into. Since I am primarily printing terrain, I have only put PLA in it. Really, the biggest issues (at least in the later iterations) seem to be the bed may be warped and the PTFE tube connectors probably should be replaced or you should have spares on hand. (I have found they are a consumable, and have replaced them on other printers in the past.) I do find the layer cooling to be light. At least it has it, but a fant setup would be much better for this 3D Printer. This printer does require some skill to assemble, but it is really pretty easy. There are numerous people in Facebook groups that are very happy to help get it working right for you. The Ender 3 is an inexpensive 3D Printer, but even so, people want to know they found a good deal. I keep a regularly updated list of deals on this page. I find deals from all over, though most are from Amazon, AliExpress, and Gearbest. I purchased mine through Gearbest with upgraded shipping ($9.95 at the time) and received it 6 days after I ordered it. That is pretty fast. Not as fast as Prime shipping by any means, but I was still pleasantly surprised at the speed. One other trick, is these use a standard power plug, so some times a different version (EU / US) is less money, and all you have to do is use the correct cable and make sure the voltage is set right (you should do that for any 3D Printer, anyhow). Should you buy an Ender 3? If you are looking for an inexpensive 3D Printer, this is probably the printer for you. If the 220x220x250 mm print volume is good enough for what you do, this is probably all you need. There are more robust printers that cost a lot more. There are other 3D Printers with larger build areas, or if you really don’t need the build area of this 3D Printer, a smaller one like the Ender 2 may be better for you. But, this 3D Printer hits the sweet spot of size, performance, and price. Usually, you get to choose 2. This is the rare time you get all 3. Thanks to Naomi Wu, Creality 3D has been making a big push to going Open Source. This is really good for the community, since we can see the firmware and make tweaks on it for our own good. It also allows Creality 3D to add good changes to their base firmware, or produce an upgrade firmware that has these tweaks in it. But they have gone a step further. They have released the entire printer as open source. From the hardware to the firmware. This printer is fully OSHWA certified as open source. Whether you buy one or not, this is good for the entire community, and something that Creality 3D should be thanked for. One of the great things about purchasing a popular 3D Printer, is the plethora of printable upgrades. From parts trays, to fan shrouds, to entirely new X carriages and coolers, you can print all kinds of things for your Ender-3. I’ve put together a page on upgrades for the Ender 3 as well. As I said before, the only upgrade I have installed is a glass bed. I do have some buck converters and LED lights to upgrade the lighting on it, and eventually, I plan to flash the firmware and have already purchased the hardware needed for that. Any purchases made through these links help the site out. It doesn’t cost you more, but if you are purchasing an Ender 3 anyhow, I appreciate the help.